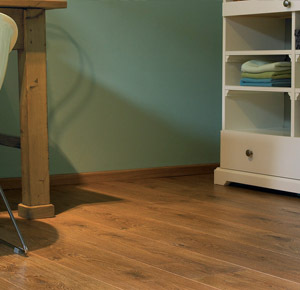 Laminate flooring can be fitted around any space. What are Laminate Floors made from? The top wear layer is provided by the melamine resin, a highly wear resistant material that makes laminate flooring so hard wearing. This top layer is very similar to the top layer on counter or kitchen work tops but is usually around 40% stronger. This makes the laminate flooring highly resistant to scratches, burns, dent’s, stains, etc. This is made up of either high density fibreboard (H.D.F.). or medium density fibreboard (M.D.F.) This is saturated in resins to make it extremely hard. Most manufactures also add a moisture resistant resin to the core. This is important as it helps keep the flooring protected against moisture penetrating the boards. How is Laminate Flooring Produced. This is where DPL & HPL are different. In the direct-pressure laminate process the decorative covering layer and stabilizing layer are pressed together onto the core layer. While the high-pressure laminate process, on the other hand, the decorative paper and overlay are pressed onto special high-strength paper first. Only in a second stage is this so-called high-pressure laminate glued to the core layer. This makes the flooring a lot more tougher and more resistant to dents etc.